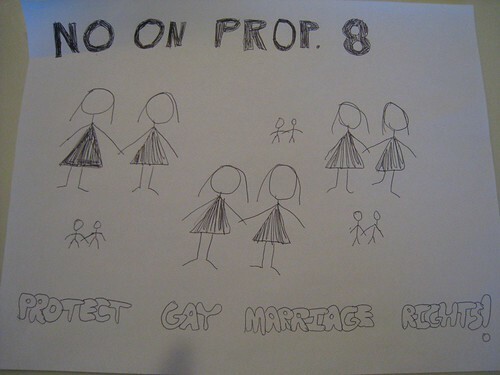 SQUIDALICIOUS: No on Prop 8 Demonstration! Why: To put a public face on the diversity of supporters against Prop 8; to demonstrate the importance of protecting equal rights for all Californians. Because this has also been a site of Yes on 8 supporters, it is imperative to demonstrate in a manner that is peaceful and nonconfrontational. Because research shows that consistent messaging creates positive impact of the message, the campaign is requesting that NO ONE SPEAK TO THE MEDIA if they arrive. Please direct all requests for comments to Allie Bay 916-284-9187 or 916-554-7683. Please bring this information with you in case you need it. Again, to achieve consistent messaging, yard signs and/or previously printed signs from the No on 8 campaign are best. If these are unavailable and you bring handmade signs, please use the following key words: UNFAIR, WRONG, UNNECESSARY, and NO ON 8. Thanks for your support! I don't know that I'll be able to go as Mali and Leelo aren't much for prolonged standing on street corners, but wanted to spread the word. Dude, I do not let my kids anywhere near this blog! But sure, point taken. Although I hear Leelo's bus so it might be a bit. Sadly I have a previous engagement. Jo said, "Baby's first arrest! ".